320 pages | 105 Color Illus. Molluscan Communities of the Florida Keys and Adjacent Areas: Their Ecology and Biodiversity is the first comprehensive overview of the ecology and biodiversity of the phylum Mollusca in the area of Florida extending from the Dry Tortugas and Ten Thousand Islands in the west to Palm Beach in the east. 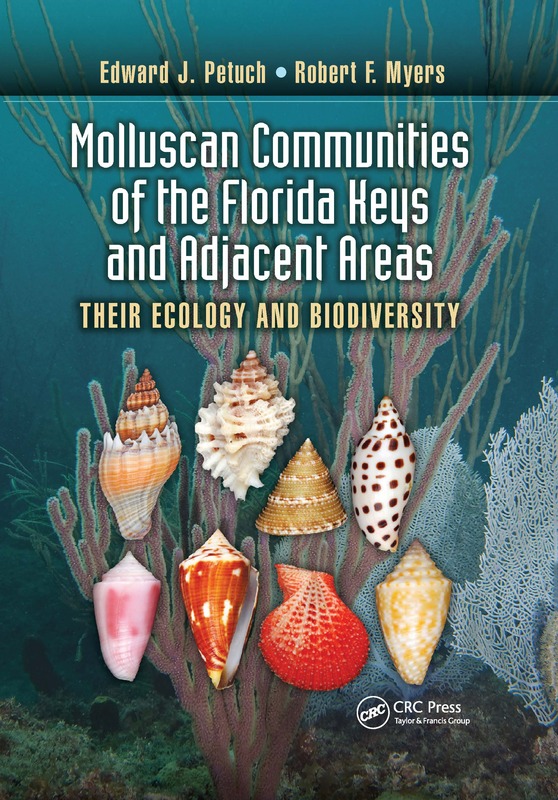 The book provides detailed analyses of molluscan faunas found in 20 different ecosystems, emphasizing the marine environments of the Florida Keys archipelago and its extensive coral reef tracts. Full-page color illustrations portray living animals, unique Keys environments, underwater ecosystems, and satellite images. More than 1,200 species of macromollusks—in 86 gastropod families and 54 bivalve families—are recorded from the study area, with color plates illustrating over 550 of the region’s most ecologically important species. For the first time in any book on the malacology of the Florida Keys area, the 20 marine ecosystems and their associated molluscan assemblages are arranged by the CMECS (Coastal Marine Ecological Classification Standard) system. This system emphasizes the hierarchical relationships determined by substrate type, bathymetry, and water chemistry. Along with complete species lists for every molluscan assemblage, this handy guide introduces ten newly-discovered gastropods, including new species in the families Muricidae, Buccinidae, Nassariidae, Naticidae, Turritellidae, and Olividae. Two new bivalves in the families Pectinidae and Arcidae are also described in a special systematic appendix. This richly illustrated book is written for the professional scientific audience interested in mollusks, marine ecology, evolution, and taxonomy as well as malacologists, naturalists, and shell collectors. It is also an ideal synoptic field guide, showing where individual species of mollusks can be found and within which ecosystems they occur. Edward J. Petuch is a professor of geology in the Department of Geosciences at Florida Atlantic University in Boca Raton, where he teaches courses on oceanography, paleontology, and physical geology. When not collecting and studying mollusks in the Florida Keys or the nearby Lake Worth Lagoon, Petuch leads an active career as a musician, giving regular concerts on the pipe organ and playing the recorder and harpsichord in university chamber ensembles. Robert F. Myers has written or coauthored numerous scientific papers and popular articles on western Pacific fishes and several books. He has also developed an application for iPhones and iPads on Florida-Caribbean reef fish identification. Myers is currently working on a field guide to Florida and Caribbean marine life and serves on the coral reef fishes Species Survival Commission (SSC) of the International Union for the Conservation of Nature (IUCN).